Interior of the Notre-Dame Basilica, located in the historic district of Old Montreal, in Montreal, Quebec, Canada. The interior of the basilica, built in Gothic Revival style, is impressive with vivid colors, stars and filled with hundreds of intricate wooden carvings and several religious statues. It was built between 1823 and 1829 after a design of James O'Donnell and it has become one of the landmarks of the city. Aquestes són les imatges candidates per a aparèixer a la pàgina principal com a Imatge del dia. La publicació d´aquesta pàgina permet als traductors afegir els texts corresponents amb temps suficient. Des de l'1 de juliol de 2007, totes les imatges del dia han de ser imatges destacades que no s'hagin usat prèviament com a imatges del dia. Les imatges destacades són seleccionades per consens entre les candidates. Una llista de possibles imatges del dia es poden trobar ací. Les Imatges del dia ha de ser seleccionada de les imatges destacades. L' Arxiu del dia actualment pot ser seleccionat de qualsevol arxiu de so o de vídeo, tot i això revisa que no violi els drets d'autor. English : "The Wings" by Studio Libeskind, a sculpture and light installation erected in 2016 for the newly built Siemens headquarters in Munich, Germany. English : A Canção da Primavera is a 1923 Brazilian silent film by Igino Bonfioli and Cyprien Segur. English : Ponds on the littoral of Les Aresquiers in Frontignan, France. English : After Christian Lindner criticised the FridaysForFuture demos saying that climate politics is for Profis, over 20000 ScientistsForFuture declared that they agree with the pupils. Català : Màscara del poble Tapirapé. 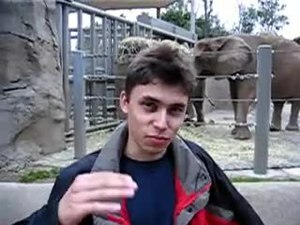 English : Me at the zoo, a short film by Jawed Karim, was the first video uploaded on YouTube on April 23, 2005. English : Lögberg (Icelandic for Law Rock), Þingvellir National Park, Southern Region, Iceland. The Lögberg was the place on which the lawspeaker (lögsögumaður) took his seat as the presiding official of the assembly of the Althing, the national parliament, from 930 until 1262 (when Iceland took allegiance to Norway). Speeches and announcements were made from the spot and anyone attending could make their argument from the Lögberg. English : Life with Father is a 1947 film by Michael Curtiz. English : A Gymnopilus viridans in Fort Flagler State Park. English : The Falcon 9 rocket on the launch pad of the Vandenberg Air Force Base on January 16, 2016, the day before the launch of the Jason-3 satellite. English : In Berlin on Alexanderplatz and in other cities there were demonstrations against housing companies and for a referendum on the nationalization of rented flats. English : Hill-topping deer botflies (Cephenemyia stimulator) on the summit of the Padauner Kogel, Tyrol, Austria. English : Sulfur-salt formation with hot spring at Dallol volcano in the Danakil Depression (Afar Region of Ethiopia). English : Cytoplasmic streaming (cyclosis) in the epidermis cells of a tulip leaf. Phase contrast. 1500x. Real time. Cyclosis provides the distribution of nutrients, metabolic products in all parts of the cell. English : Bottom view of one of the iwans of the Agha Bozorg Mosque, a historical mosque in Kashan, Iran. The mosque, located in the center of the city, was built in the late 18th century by master-mimar Ustad Haj Sa'ban-ali. The mosque has of two large iwans, one in front of the mihrab and the other by the entrance, and a courtyard in the middle. English : Birdhouses on Sidney Spit (part of Gulf Islands National Park Reserve), Sidney Island, British Columbia, Canada. English : The Theatine Church of St. Cajetan (German: Theatinerkirche St. Kajetan) is a Catholic church in Munich. Built from 1663 to 1690, it was founded by Elector Ferdinand Maria and his wife, Henriette Adelaide of Savoy, as a gesture of thanks for the birth of the long-awaited heir to the Bavarian crown, Prince Max Emanuel, in 1662. Now administered by the Dominican Friars, it is also known as the Dominican Priory of St. Cajetan. English : Flemish winged triptych at the Church of the Teutonic Order in Vienna, Austria. Panel paintings and woodcarvings by anonymous masters; polychromy of the woodcarvings by Jan van Wavere, Mechelen, signed 1520. This altarpiece was originally made for St. Mary's Church, Gdańsk, and came to Vienna in 1864. English : A simple computer animation showing a ship passing a lock. English : Broomtail wrasse (Cheilinus lunulatus) in the Red Sea at Makadi Bay, Egypt. English : Charlotte Becker of Germany, competing in the 2018 UCI Road World Championships in Innsbruck. English : Iny Hono Izy Ravorona (English: Take Her/Him With You Dear Bird) is a very old Malagasy lullaby which talks about the dialogue between a mother and a bird, the mother asking to the bird to take her child for a journey and give it back to her after it. English : Opera Theatre, Yerevan, Armenia. The building, designed by the Armenian architect Alexander Tamanian, was officially opened in 1933 and consists of two concert halls: the Aram Khatchaturian concert hall with 1,400 seats and the Alexander Spendiaryan Opera and Ballet National Theatre with 1,200 seats. English : The Crookes radiometer (left) and the Mendocino motor (right) both convert light into motion. The first uses air dilation by having one side of the propeller being heated more than the other side, and the second uses solar panels, coupled with electromagnets and magnets to rotate. English : Train (metro car type 81-817/814) arrives at Nevsky Prospekt metro station, February 2019. English : “Selig sind, die da Leid tragen” - 1st movement of A German Requiem composed by Johannes Brahms. 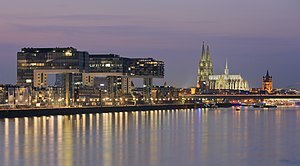 English : Panorama of Cologne, including the Kranhäuser and Cologne Cathedral, as seen from the Rhine. English : The Ostermarsch (easter march) is a yearly event of German peace activists. English : Mountain gorilla (Gorilla beringei beringei), from the Titus Group, Volcanoes National Park, Rwanda. English : Metridium farcimen (white-plumed anemone) at aquarium in Tokyo. English : The animation of the Julia set for the complex quadratic polinomial fc(z)=z^2+C. English : The Merry Frolics of Satan is a silent hand-colored 1906 film by Georges Méliès. English : Interior of the Notre-Dame Basilica, located in the historic district of Old Montreal, in Montreal, Quebec, Canada. The interior of the basilica, built in Gothic Revival style, is impressive with vivid colors, stars and filled with hundreds of intricate wooden carvings and several religious statues. It was built between 1823 and 1829 after a design of James O'Donnell and it has become one of the landmarks of the city. English : Amapola- Los campesinos no son criminales is a Columbian stop motion explanational video on the cultivation of poppy in South America. English : A SpaceX Falcon 9 v1.1 rocket is rolled out to Cape Canaveral Space Launch Complex 40 on April 26, 2015, in advance of the April 27 launch attempt for the TurkmenÄlem52E/MonacoSAT telecommunications satellite. English : The Prinz Carl Palais, Munich, is a mansion built in the style of Neoclassicism between 1804-1806. Today the state of Bavaria uses it for representative purposes. English : International Girls in ICT Day is a global celebration that invites girls and young women around the world to explore the many exciting opportunities offered by a career as an ICT professional.